Categories: Blooming Orchids, Products with Free Shipping. Orchids make a lovely gift. 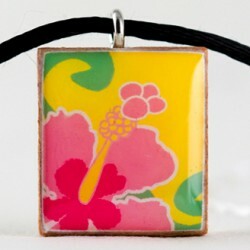 They will also beautify your own home or office. 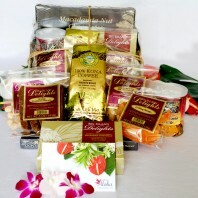 We have several mixes for you to choose. All are sent in bloom and potted with a base. Shipping is free. If you need particular colors please let us know. As always, ordering your orchids in advance will give us more time to find exactly what you need. For a gift that lasts as much as a year please see our Orchid of the Month Club. You can send one or two blooming dendrobiums each month. Each will be different. Choose 3, 6 or 12 months. Also with free shipping. Below is a brief description of our blooming plant selections. These standard dendrobium orchids are table top plants ranging from 16″- 24″ tall with 6 to 10 buds per spike. The plants will have double, or, when double spikes are not available, single spikes with some blooms yet to open. Selection may be limited to single spike plants during the winter months when growth is slower. These orchids will rebloom once a year or more with simple orchid care. Most common colors are purple, green pink and lavender though our botanist is continually creating new varieties. Dendrobiums are the most popular lei making flowers and are used for graduation leis and at Hawaiian weddings. Shipped in a 4″ pot. If you need particular colors for your wedding or other event please contact us. Free shipping to any US state by Priority FedEx. Exotic orchid and dendrobium orchid mix. 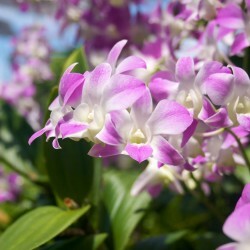 We are introducing a new selection of live Hawaiian dendrobium and exotic orchids. Our basic orchid plant is the dendrobium. These are the most popular because they are easy to care for, bloom for 4 to 6 weeks at a time. These orchids will bloom again and again. Dendrobiums are also used in making our most popular leis. Our growers are constantly experimenting with new crosses of orchids and produce a large variety of colors including whites, greens, purples and other combinations. We will select the colors for your plant or assortment according to what is available. But if you require a particular color for centerpieces, wedding favors, or other events please call or email in advance. We now also offer oncidium orchids as well as other species. Also intergenerics of exotics which produce a wide variety of colors many of which are unique. These are offered as ‘exotic orchids’ and may include brassia, oncidium, compact cattleya or others according to the season. These orchids are shipped when they first come into bloom. They will typically stay in bloom for about 4-6 weeks at a time. They require very little care. 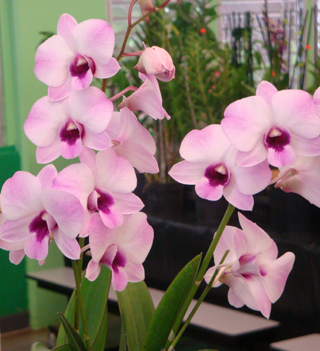 A dendrobium or exotic orchid will thrive under normal household conditions. Your exotic orchid and dendrobium plants, if cared for, can live for many years and bloom again and again. We will include instructions for taking care of the orchids with your shipment. Hawaiian orchids are also ideal for those in assisted living or professionals with limited space at the office. As your dendrobium grows it will eventually need a larger pot. This is quick and easy to do. For the best information on taking care of Hawaiian orchids we recommend you follow the American Orchid Society. Their web site if full of useful information. Joining their Facebook page will let you exchange questions and ideas with experienced growers everywhere. Dendrobiums are cultured and grown in Hawaii. All our potted plants and cut flowers are sent by Federal Express Priority. All are packed with great care to arrive in perfect condition. If there is a problem with your shipment please let us know. We’ll take care of it. What are exotic orchids? Exotics can include brassia, oncidiums (shown in yellow here), cattleya or others according to seasonal availabilty. Perfect for a beginner to start a collection with a lot of variety and interest. They require similar care to the dendrobiums. These orchids fare well in a home environment. Grower’s choice of colors and species. Many selections are created by the botanist at the nursery. 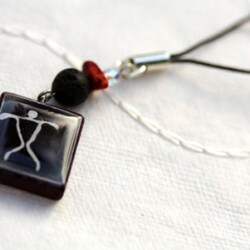 Each will include an identification tag. When ordering more than one orchid we’ll make sure each is different unless you tell us otherwise. Your orchid will arrive with a four inch pot and pedestal so it is ready to show. It will also be in early bloom with more buds yet to open. These exotics can easily be grown in the home or office. They do not need a greenhouse or special lighting. We’ll include the simple care instructions with the orchids. When you send an orchid plant or assortment as a gift we will send your personalized gift note. We’ll also include easy to follow instructions for the care of the new blooming orchid plants. Our live orchid plants include free shipping by FedEx Priority. Your orchids are staked and wrapped to protect them during shipment. As always your shipment is guaranteed so if the plants are damaged in shipping please call immediately. For more on orchid care visit the American Orchid Society web site.